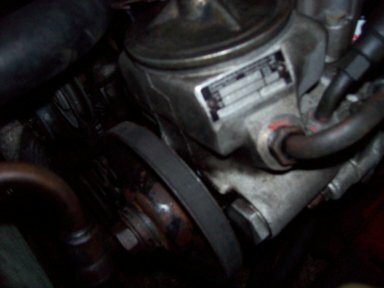 was checking belts and realized the previous owner had a longer belt on power steering pump to pully and was rubbin away the vacuum pump on front of engine...tried correct size belt but still hits vacuum pump...think it's wrong power steering pump?...1982 300d non turbo...think engine might have been replaced...any ideas?...thanks!!! Euro spec car? Can you take a picture of the problem area and pump? It does sound like you have the wrong power steering pump PSP, OR, the mounting brackets for your pump are bending or cracking. The PSP can actually break off! Unfortunately, I have first-hand experience. I bought a junkyard PSP rebuilt it because I didn't have a core. That is a long story and you can read about it on ShopForum. In the process, I found the Mercedes Benz Power Steering Pump Heaven. You can look and see what kind of pump you should have and/or order the right one. If your pump dies it can be very dangerous. If your vacuum pump goes out it can be very expensive. Biodiesel B100 when I can find it. nothing appears bent...all bolts are lined up with holes...guess wrong pump?..would wrong pump fit bracket?...thanks!! it looks like it is right pump but the belt is riding across the vacuum pump instead of in front of it...what's this about? sorry to keep posting but is it possible the wrong vacuum pump is on engine? could this vacuum pump be too long and is hit the psp belt? It is not clear on the pictures, but what does that idler pulley w/o a belt belong to? 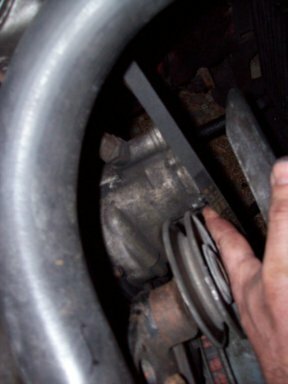 OK I am not 100% familiar with the Non-turbo 300D, but on the turbo motor the power steering belt resides on the outer groove (towards the radiator) on the main pulley. This position allows the belt to be in front of the vacuum pump. Hope this helps. yes it is on the outer groove and lines up with power steering pump pully but the vacuum pump is either too long or something..?? Not sure, I would think, tho, that a different vac pump would not bolt in. The 617.912 is a 5 cylinder non turbo, that's all. Are you able to determine a part # on the P/S pump? There were two, 1st and 2nd version, don't know the difference between the two. I imagine the position would be the same, as the pulleys on the crank should line up regardless. If the PS pump is right, and the vacuum pump is right, then it has to be the brackets, or pulleys + belt.